The court denied defendants' motion to amend their invalidity contentions three months after claim construction. "For most of the constructions that differed from [defendant's] proposed constructions, the Court simply adopted the constructions proposed by [plaintiff]. . . . Therefore, [defendant] was aware of the risk that the Court could adopt these constructions . . . yet it waited until more than a year later to seek amendment of its invalidity contentions. . . . [Defendant] notes that a few of the Court’s claim constructions differ from those proposed by both parties. However, [it] does not state that it is these particular constructions that necessitate amending its invalidity contentions. . . . [E]ven assuming it was proper for [defendant] to wait until the Court’s claim construction order was issued before seeking amendment, [it] was not diligent in seeking amendment once that basis for amendment was discovered." The magistrate judge recommended granting in part plaintiff's motion for attorneys’ fees under 35 U.S.C. §285 following summary judgment, an appeal, and a jury trial, and approved counsel's hourly billing rates of $335-495. "[Plaintiff's attorneys' fees expert] credibly testified that plaintiff's attorneys had obtained excellent results in this case which the Court does not take exception with. . . . In terms of the reasonableness of plaintiff's fee request, the Court finds it particularly helpful to compare that with [defendant's] own legal expenses in terms of hourly rates, the number of hours that were expended, and the overall amounts that were billed. On all three of those fronts, what [defendant] logged and charged in this case exceeded that which was spent by the plaintiff. . . . And given the different purpose that §285 serves as compared with other grounds upon which attorney's fees can be awarded such as Rules 11 or 37, the Equal Access to Justice Act, or other fee provisions within Title 42, the Court declines to use the hourly rates that were arrived at in resolving the discovery-based disputes that arose earlier in this case." The court denied defendant's motion in limine to exclude "all testimony, argument and reference to the alleged indemnification of defendant." "Plaintiffs want to use Defendant’s indemnification by its manufacturer as proof of Defendant’s knowledge that an infringement claim was likely, which is relevant to willfulness. The indemnification agreement is not being used to infer liability, which has already been determined by the Court as to [one product] and will be determined based on the technical evidence as to the [other product]. Therefore, evidence of the indemnity is unlikely to cause the inferential leap that FRE 411 guards against. Instead, the evidence directly shows that Defendant had knowledge of the risk that it infringed the [patent]." The court granted defendants' motion in limine to exclude plaintiff's infringement expert and his report. "[Plaintiff’s infringement expert] did nothing more than try defendants’ products on various (unidentified) ear molds and state that defendants’ products infringed based on conclusory ipse dixit recitations of claim limitations with no explanation or analysis. . . . [He] never conducted any quantitative analysis (i.e., size, measurements, dimensions, or positioning) of the earbuds, headsets, and ear molds he examined. . . . [He] also never even identified which [of the 60] ear molds . . . he tested. . . . What justifies striking him at the end of the day is that his report merely parroting the claim language to find infringement will be unhelpful to the jury. Bald claim-ridden statements — with no analysis — that simply proclaim that defendants’ products infringe cannot help the jury in making their findings." The court denied defendant's motion for summary judgment that plaintiff's data transmission patent was invalid for lack of patentable subject matter and found that the invention did not fail the machine-or-transformation test. "Typically, transforming data from one form to another does not qualify as the kind of transformation that the Supreme Court . . . regarded as an important indicator of patent eligibility. In the case of an invention in the field of encryption, however, the entire object of the invention is to transform data from one form into another that will be recognizable by the intended recipient but secure against decryption by unintended recipients. In that setting, it does not make sense to say that the transformation of data from one form to another cannot qualify as a patent-eligible invention, because that is what the field of cryptology is all about. . . . [A]lthough the invention in this case does not result in the physical transformation of matter . . . it involves a specific system for modifying data that has equally concrete and valuable effects in the field of electronic communications." The court granted defendant's motion for summary judgment that it did not willfully infringe plaintiff's patent because, on interlocutory appeal, a dissenting Federal Circuit judge opined that plaintiff's patent was invalid. "[I]n this case [a Circuit Judge] . . . dissented from the Federal Circuit's panel decision that upheld this Court's ruling as to the validity of the [patent-in-suit] -- in his view 'all of the claimed elements . . . were present in the prior art' . . . and 'the claimed invention is nothing more than a repetition of steps already known in the art' . . . [Plaintiff's] counsel misses the mark entirely in arguing that [defendants] 'did not and could not rely on either of these post-litigation factors when it began infringing the [patent-in-suit] -- the relevant point in time for determining its willfulness.' That is of course nonsense, for the key issue in the analysis is not the time sequence but rather the fact that the dissenting opinion conclusively establishes that [defendants'] non-willfulness argument cannot be viewed as objectively reckless." The Board denied the petitioner's request for rehearing of an earlier decision not to institute inter partes review because "the Petition . . . was not filed timely within the statutory period of 35 U.S.C. § 315(b)." The petitioner previously argued that the petition was timely because "a petition within one year of 'any complaint' . . . nullifies the effect of the earlier . . . complaint." On rehearing, the petitioner "present[ed] selected segments from the legislative history to buttress its argument that the statute only applies to concurrent litigation . . . . Petitioner also asserts, for the first time, that the statute 'is plainly ambiguous.' . . . Contrary to Petitioner’s new argument, even if Congress intended to reduce issues in district courts, this does not overcome the plain meaning involved in Congress’s carefully balanced statutory scheme that applies the time bar to 'a complaint.' . . . Although Congress intended to create a cost-efficient alternative to district court litigation, it does not follow that the time bar only applies to concurrent litigation." The court awarded monetary sanctions for plaintiff's instruction to employees to delete certain emails before filing suit and failure to implement a litigation hold until after filing suit because plaintiff's duty to preserve information arose when it acquired the patents-in-suit. "The Court agrees that [plaintiff] probably acquired the patents with an eye toward litigation. However, it is difficult to say that litigation was reasonably foreseeable before [plaintiff] even acquired the thing which would give it standing to sue. Thus, since [its] acquisition of the patents was a condition precedent to its ability to even initiate the litigation, the Court thinks it was likewise a condition precedent to [plaintiff's] duty to preserve evidence." The court denied defendant's motion to disqualify plaintiff's counsel. Although two attorneys at plaintiff's firm previously represented defendant in a patent suit, plaintiff's counsel sufficiently screened those two attorneys. "Pursuant to the screen, which the Court finds was timely implemented three days after [plaintiff's firm] was formed, [the two attorneys] have been isolated from any participation in the current matter, including a written agreement that the two attorneys would avoid any communication with other [firm] personnel relating to the [current] matter. All [plaintiff's] lawyers have been notified of the screening and are continuously notified on a monthly basis that the screen is still in effect. Additionally, several mandatory security measures (i.e. password protection) have been put into place. . . . Therefore, even if the Court were to find there was a conflict under ABA Model Rule 1.9, the Court would find [counsel's] screening protocol sufficient as a means of avoiding imputing any such conflict to the entire firm." The magistrate judge recommended granting defendants' motion to strike the report of plaintiffs' infringement expert because his opinions were unreliable. "[Plaintiffs' expert] purportedly addresses how each accused product infringes [the patents-in-suit]. His conclusion, however, fails to provide any analysis of how infringement was determined, and merely contains conclusory statements. . . . [He] merely states the claim limitations followed by general references to several documents and [a deposition]. Nowhere does [he] explain why the documents or deposition are relevant to the technology involved or to [the patent], how they show why claim 3 of the [patent] covers the accused product, or how they demonstrate or provide the required analysis of the claim elements to the accused product. . . . [E]ven if the court assumes the documents and deposition referenced by [plaintiffs' expert] contain the necessary analysis, it is not the court's role (nor the opposition's responsibility) to comb through these documents, extrapolate the necessary information, analyze it, and hobble together an expert opinion based on assumptions of what the expert felt was significant." The court denied plaintiff's motion to exclude defendant's expert because of his reliance on an umbrella license between plaintiff and its sister company. "The umbrella license that this motion revolves around is a license between [plaintiff] and . . . [one of plaintiff's] sister companies. The license covers all of [plaintiff's] U.S. intellectual property, 'including all patents, Know-how, Designs, Domain Names and Trademarks . . .' Because of the license, '[plaintiff's sister company] pays [a] license fee to [plaintiff] based on essentially all of [plaintiff's] sales and revenue in the U.S., not merely its sales of destination dispatch overlay.' 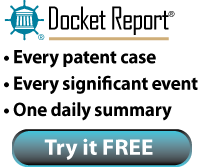 Furthermore, the license includes the patents-in-suit. . . . [Defendant's expert] at least minimally connects the license in question to the patents-in-suit and rather than simply extract a royalty rate from the previous license, uses the license as only a single component of his entire analysis." The court denied defendants' motion to extend time to file their notice of appeal of a $40 million judgment and rejected defendants' argument that the e-mail notice of electronic filings failed to provide sufficient notice of the court's ruling on three post-trial motions. "Defendants argue that the e-mail notice of electronic filings (NEF' s) that defense counsel received . . . only contained language regarding the Court's grant of their motions for leave to file sealed documents, but failed to mention the denial of their substantive post-trial motions. . . . Defendants note that the docket entries for the orders at issue . . . were modified . . . to reflect the denial of the substantive post-trial motions, but no new electronic notices were sent by the Court's electronic case filing (ECF) system to reflect these amended docket entries. . . . The Court finds that Rule 77(d) imposes on attorneys the responsibility to check on the status of their case. The Court notes it is every attorney's responsibility to read the substance of each order issued by the Court, and to read the order in its entirety. . . . Defense counsel admits that the orders were 'downloaded and stored' by litigation assistants in two different firms representing Defendants; yet, it appears that nobody actually read the orders. The Court finds it is not sufficient for attorneys to rely on the electronic and e-mail notifications received from the ECF system, as the docket entries and notifications do not always convey the Court's disposition in its entirety. The substance of the orders carry validity under the law, not the electronic NEFs. . . . [D]efense counsel's failure to check the docket activity or the status of the case for over 52 days does not entitle Defendants to an extension of time to file a notice of appeal under Rule 4(a) of the Federal Rules of Appellate Procedure." The court denied defendant's motion to dismiss plaintiff's amended claims for induced infringement for failing to sufficiently plead intent. "[Defendant] . . . suggests, based on the Federal Circuit's recent decision in Commil USA, LLC v. Cisco Sys., Inc., 720 F.3d 1361 (Fed. Cir. 2013), that it cannot possess the requisite intent to induce infringement because it has a good faith basis for believing the patents-in-suit are invalid. This purported good faith basis arose after [plaintiff] filed its First Amended Complaint, when the [PTAB] granted [a former defendant's] petition for inter partes review of six of the patents-in-suit, based on a reasonable likelihood that [the former defendant] would prevail in showing some of the claims at issue are unpatentable. . . . There is no basis to expand Commil into a pleading requirement. More importantly, the public IPR documents to which [defendant] refers do not, taken in the light most favorable to [plaintiff], require a finding that [plaintiff's] pleading of intent is deficient and merits dismissal of the induced infringement claim." The court denied the parties' stipulated motion to vacate an earlier order granting defendants' motion for spoliation sanctions after the parties settled the case. "The court will not agree to hide the discovery abuses of the plaintiff in this case by withdrawing [its order]." The Board denied the patent owner's motion to reconsider an earlier decision instituting inter partes review and rejected the argument that the petition was untimely under § 315(a)(1). "[The patent owner] contends . . . that the cases cited in the Decision to guide our interpretation of the term 'filed' do not construe that term and are not relevant to § 315(a)(1). We disagree. The cited cases are instructive to show that federal courts, including the Federal Circuit, treat dismissals without prejudice as if the actions were never filed. We interpreted the use of the term 'filed' in § 315(a) against the backdrop of this well-settled law. [The patent owner] has not shown an abuse of discretion in the Decision in this regard. . . . Accordingly, it is ordered that [the patent owner's] Request for Rehearing of the Decision to institute inter partes review is denied." Following summary judgment of noninfringement and invalidity, the court denied defendant's motion for attorneys’ fees under 35 U.S.C. § 285 even though plaintiff and its counsel engaged in vexatious litigation amounting to misconduct. "From the beginning of this case, [plaintiff] flouted the standards of appropriate conduct and professional behavior. . . . At the scheduling conference, [plaintiff] began implementing its abusive discovery strategy: avoid its own litigation and discovery obligations while forcing its opponent to provide as much information as possible. . . . [Plaintiff] certainly abused and twisted its statements of law to the Court. . . . Although [plaintiff's] behavior has been inappropriate, unprofessional, and vexatious, an award of attorney fees must take the particular misconduct into account. This case has been fraught with delays and avoidance tactics to some degree on both sides. . . . At no point did the parties seek discovery sanctions under Fed. R. Civ. Proc. 37. . . . Given that the litigation followed an expected course of motions practice, and that discovery sanctions were available to [defendant], there is no gross injustice in failing to award of attorney fees in this case." The Board denied the patent owner's motion to terminate the IPR as not timely filed under 35 U.S.C. § 315(b), and rejected the patent owner's argument that the phrase "complaint alleging infringement" includes all federal proceedings adjudicating patent infringement allegations. "We do not adopt [the patent owner's] interpretation that an allegation of infringement in an arbitration proceeding triggers the one-year time period of section 315(b). Within the context of section 315(b), the phrase 'served with a complaint alleging infringement of the patent' means a complaint in a civil action for patent infringement. What matters is that the complaint pleads a cause of action for patent infringement and is served lawfully on the accused infringer in a civil action. Once that happens, the accused infringer is subject to the time limit set forth in section 315(b) to petition for inter partes review. . . . Given the Supreme Court’s narrow interpretation of the terms 'action' and 'complaint' in [BP America Production Co. v. Burton, 549 U.S. 84 (2006)], we likewise narrowly interpret section 315(b)’s use of the same terms as limited to a judicial action." In a final written decision, the Board rejected the patent owner's argument that res judicata or collateral estoppel barred the Board from determining that the challenged claims were unpatentable under §101 in light of an earlier district court judgment. "Patent Owner argues that collateral estoppel . . . applies to Petitioner’s challenge under 35 U.S.C. § 101 because the question is purely one of law, rather than fact, to which the clear and convincing standard is not applicable. Thus, Patent Owner argues that in this case, the patent is expired and cannot be amended, the Board adopted the Court’s claim construction, and that for questions of law, district courts and the Board apply the same standard. Patent Owner’s underlying assumption that subject matter eligibility determinations are pure questions of law, not subject to the clear and convincing evidence standard, is not supported by the Federal Circuit. Because the Board applies to the underlying facts an evidentiary standard that is different from the standard applied by the courts, the issue decided by the Board is not identical to the one decided or litigated in the first action and could not have been essential to the final judgment in the first action. Petitioner did not have an opportunity to litigate the issue in the first action. Therefore, we conclude that Petitioner’s challenge under 35 U.S.C. § 101 is not barred by res judicata or collateral estoppel."